Preparing to read the story of Samson (Judges 13-16) for my Biblical Studies class, I remembered the character of Samson as a heroic champion whose fate stood beyond his control, as he was deceived by Delilah and regretfully lost his supernatural strength. After reading the story, however, I was taken aback at the poor portrayal of him as a heroic Biblical figure. Samson’s characterization as a hero starts off as many other significant Biblical figures’ do: his barren mother succeeds in conceiving and a prophecy of greatness is bestowed upon him by God. Samson also carries a special title as a Nazirite, meaning he is supposed to be an ultra-faithful follower of God. As a Nazirite, Samson is supposed to abstain from drinking wine, refrain from touching dead bodies, and avoid cutting his hair. 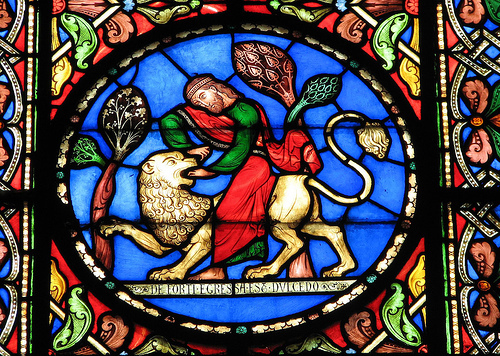 Samson breaks all three: he throws a מִשְׁתֶּה (mish’te) or a “drinking party” (Judges 14:10), kills a lion and scrapes honey from his belly (Judges 14:9), and eventually has his hair cut, though not willingly (Judges 16:19). Furthermore, there’s a physicality and a brutishness in Samson that is atypical of the Biblical hero. While the prototypical Biblical hero takes a wife – or, sometimes wives – for the sole purpose of reproduction, Samson interacts with many women in his lifetime – the most famous one being Delilah – including a prostitute, in order to fulfill his physical needs (interestingly, he also never fathers children – a very important role required of any man in Israelite society back then). Samson is then portrayed as a physical and impulsive being, much like Enkidu, an animalistic, yet important, figure in Mesopotamian mythology. This contrasts with the other standout “heroes” of the Bible – such as Abraham, Joseph, Samuel – who either devote their entire lives to God or at least live their lives under God’s guidance, which highlights the moral nature of their characters. Moreover, Samson is depicted as an aggressive and violent character, as he kills thousands of men in his lifetime. When he says near his death, “Please, God, strengthen me just once more, and let me with one blow get revenge on the Philistines for my two eyes” (Judges 16:28), it seems as if his life’s mission is to avenge and kill as many people as possible, whereas the usual task of the Biblical heroes is to enforce a loving relationship between the Israelites and their God. Also, like our modern hero Superman – but unlike the Biblical heroes – Samson possesses the supernatural power of strength, which could always be severed by the cutting of his hair (like Superman’s kryptonite). Samson definitely seems to simulate the heroes of ancient Mesopotamia and the modern heroes of today – who were probably modeled after these ancient heroes, both near eastern and Greek – through their privileged birth, supernatural powers, and preoccupation with the physical. Thus, I conclude that, although he was a hero in his own right, Samson was unlike the Biblical heroes of his era: he never had anyone’s support or companionship, was always betrayed (especially by his girlfriends), and always chased after (by the Philistines). Needless to say, Samson’s situation is the hairiest of them all. For more posts on things you need to know, click here.